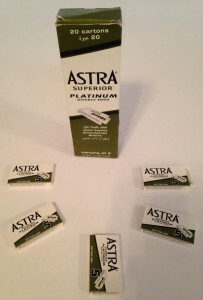 This review is going to be about some Astra Platinum Blades that I bought off of Amazon this past August. I know that it’s been quite a while between me purchasing them and using them, but I think you will see that it actually adds to the review. 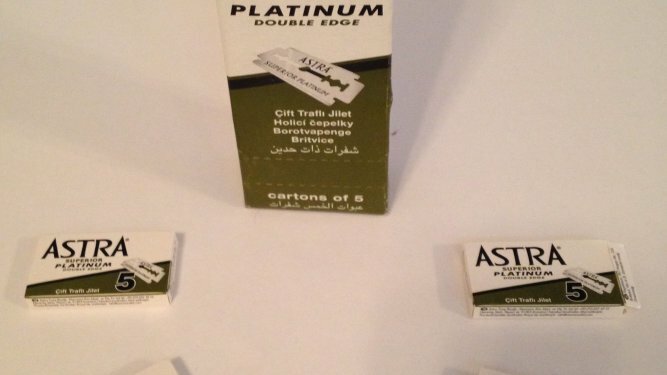 I bought the Astra Platinum Blades at the same time I bought a safety razor off of Amazon. The blades came in a box of 100 for a price of $11.99, not including shipping. Since the blades were one of the top-sellers I figured I’d find out why. I didn’t know if they were a top-seller because of their price, the way they shaved, or both. The first time I shaved my face with them I had a difficult time. However, this didn’t have anything to do with the blades, since it was my first time shaving with a safety razor I was still learning what angle to hold the safety razor at. Once I got the right angle down, the Astra Blades cut through my facial hair easily and smoothly without any tugging. That first shave I decided to only perform a single pass going with the grain. After the shave I used a q-tip to wipe 90% rubbing alcohol on the blade to disinfect them. My second shaving session with the blades happened 2-3 days later. I used the safety razor with the same Astra blade as before. This time I did two passes on my face(WTG and ATG) and two passes on my head(WTG and ATG). At the end of the shave the blade was still cutting through my hair smoothly. Once again I cleaned the blade with rubbing alcohol. I shaved with the same blade a third time three days later. Once again I did two passes on my face and two passes on my head. Once again the blades performed flawlessly. After the shave I cleaned them with rubbing alcohol. For me, this tells me that the blades perform really well. I am quite happy to have gotten three shaves out of the same blade so far. If you count my head as separate shaves, then the shave count for this blade is up to 5. However, I’m a conservative man so I’ll just call it three shaves. Since I have been able to get three shaves out of them so far, as of the time of this posting the cost per shave of these blades is 4 cents/shave($12/100 blades/3 shaves). If we extrapolate this number out for a year we get a total of $14.60 spent for a year’s worth of blades while shaving everyday(365 days x 4 cents). Since this review is about the blades themselves, I didn’t include the cost of shipping into the previous numbers or the cost of the safety razor handle. For the sake of completeness the safety razor was $33 and the shipping was $15. Add those numbers up and you get a total of $62.60 spent on razor and razor blades for the year. I’ve decided to leave out the cost of shaving cream/soap because you would have purchased those anyways. The second year your shaving costs would drop down to $32.85. This is assuming that you still get the blades for $12, you pay $15 in shipping and you get 3 shaves out of every blade. Most likely you will pay even less than that. This is due to the fact that my shipping rate is probably one of the higher ones you’ll find. Also, you can probably get more shaves out of each blade than 3 shaves, so this will further push the cost of the razor down. I’ll update this when I have shaved some more with them. If you are worried about how the blades will hold up while they are waiting to be shaved with, I would say you don’t have much to worry about. The blades I purchased were sitting in a box for 5 months before I got around to using them. This doesn’t seem to have affected the way they shave whatsoever. I am thoroughly impressed with these blades. I think their performance is superb and their cost is fantastic. If you are looking for quality DE blades at a reasonable cost, then look no further. 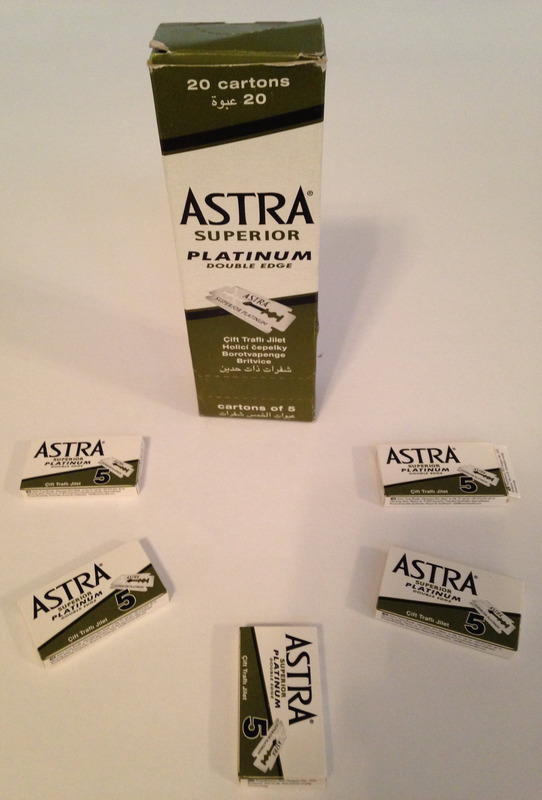 If you’ve used the Astra Platinum Blades before, what’s your opinion? Let me know in the comments below. Previous: Can You Shave Your Head Using A Safety Razor?